It feels so good to finally be doing something. The last two (what??) years have felt like a lot of time spent sitting around, but it turns out that whole lot of nothing has to happen before one can do something. It can be frustrating when I want to paint, but I can't paint because drywall is damaged. There's no point in patching the dry walll, because we're replacing the windows. I divided up our list of projects into "Contract Out" and "DIY." Since the newer part of the house (living room, master bed/bath) has the most work needing to be contracted out (windows! ), I designated that "The Forbidden Zone." I'm not letting myself do anything over there no matter how small or doable. This has been immensely helpful in keeping me sane. As I'm lying in bed at night staring at the misfitted moldings, I just tell myself "Forbidden Zone!" and fall asleep. And if I am in the other half of the house thinking, "I need to do something!" I simply walk into the guest room and pull nails out of the wall. But more on that later. When I walked into the guest room during our final walk through, I burst into tears. The two times we had viewed the house, the room had been crammed full of furniture and had curtains hanging up. Completely bare and lit up, the room now obviously had water damage that had been incorrectly repaired, cracked drywall, missing moldings, and an awkward "walk-in closet" that the previous owners had DIY'd. Note: The previous owners DIY'd in every room of this house. It has completely soured my opinion ofhome renovators. May I suggest that the next trend be DIYCOHAP (Do It Yourself Correctly or Hire A Professional)? There was no away around it. We were going to have to pull out the drywall and install it correctly. Also biting the dust was the awful, awful closet. Words cannot even describe, so maybe this picture will help. The back of this admittedly oversize room had been converted to a closet and an outdoor storage unit. At some point someone decided using an inside room as an outdoor storage unit wasn't working too great, and the sealed it up. Without using an insulation.. So there was a standard sized room, a walk-in closet flush with the window, and a sealed up space that we couldn't access. Space we can access! 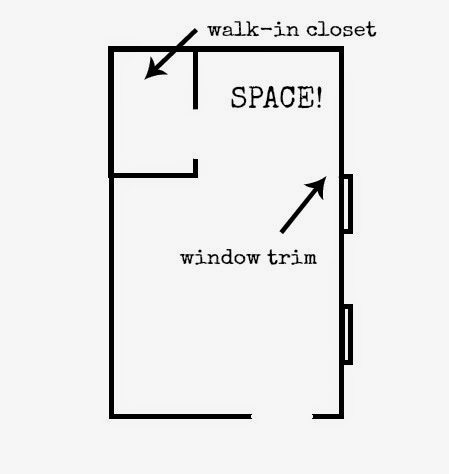 Space for window trim! Even more space! 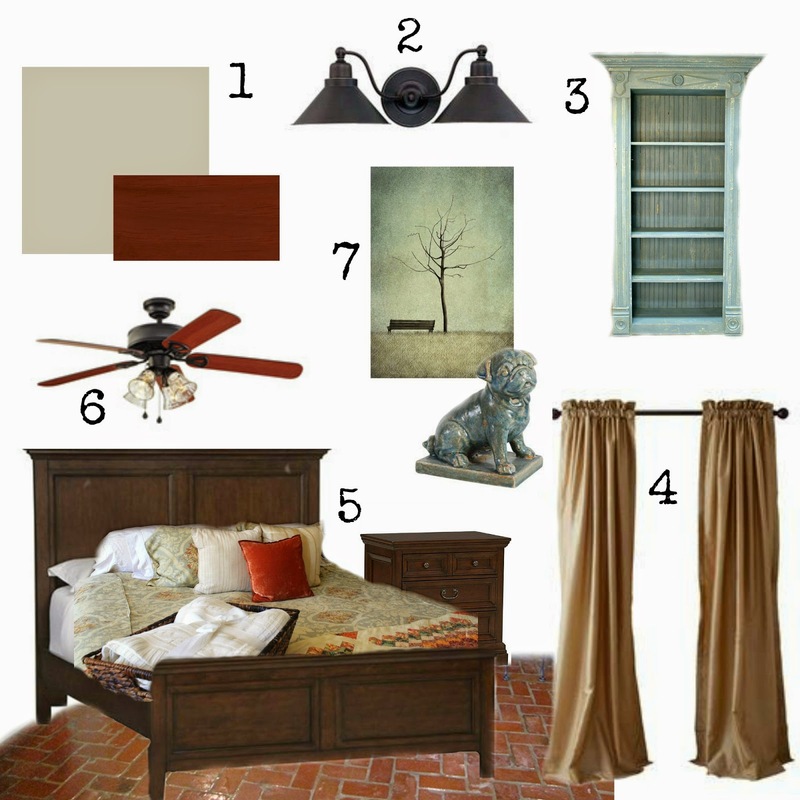 We're in the process of pulling down the drywall, but in the meantime, I put together an inspiration board. Because that's more fun and less itchy than pulling out moldy insulation. 1. Paint: Sherwin Williams Worldly Gray and wood trim stained to match the rest of the house. More to come on choosing paint colors and matching wood stain! 2. 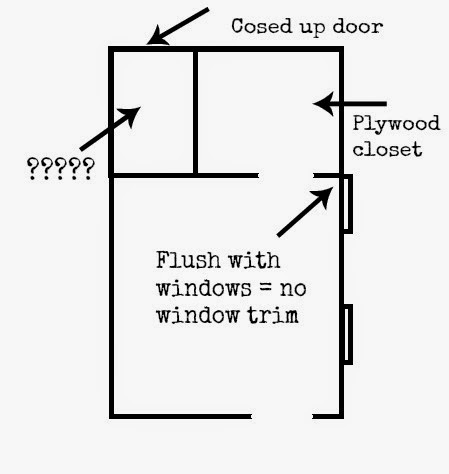 The wiring in our weird unique house is mostly on the walls because the ceiling is wood paneled and there is no attic. Something I never would have considered before having to deal with it. It is tricky to find wall lighting that gives off enough light and doesn't look like it belongs in a bathroom. I was thrilled to find this barn light at Joss & Main (unfortunately, that item is sold out). 3. With the gray walls, wood trim, and brick floors, I think a subtle painted piece of furniture would do great in there. I have my eye on this bookshelf from Shanty 2 Chic, but we'll have to see how that goes. If I don't build it myself, I'll have to have my friend Hazelnut paint something for me. 4. These curtains are also from Joss & Main. 5. The furniture and bedding is moving from our bedroom to the guest room. As hard as we've tried, we cannot make the solid, king-sized set fit in the master bedroom. But now the guest room will have plenty of space! 6. I waffled for a while on replacing the ceiling fan with another ceiling fan. There are some gorgeous orb chandeliers right now. But as much as I like a modern French Countryside style, we don't have a French countryside climate, and fans are necessary. I think the clear bulbs on this are lovely. 7. I am so in love with that little blue pug, I can't even stand it. He might just end up in our house. And I like the idea of mixing in some illustration art with the classic furnishings. Perfect. We will be in touch. I love your inspiration board!